We know you love your all-terrain and off-road vehicles. Whether you’re a hunter, rancher, farmer, or a trail rider you need to make sure you and your vehicle are protected. Menath Insurance will help you protect your off-road and all-terrain vehicle on the trail or in the garage. Coverage will follow you to wherever you take your All-Terrain Vehicle. Coverage for travel on your own property which isn’t covered under most homeowners policies. Coverage for multiple drivers and riders. 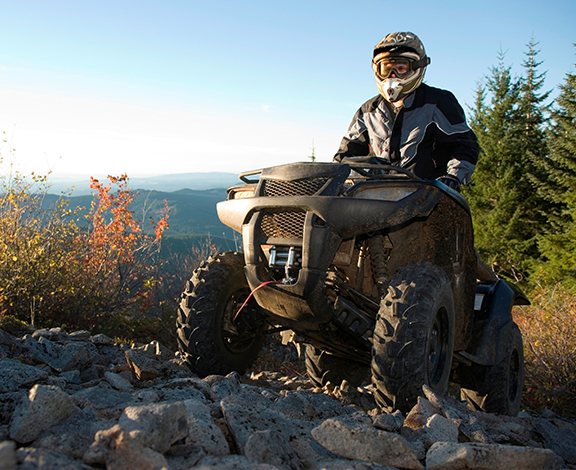 Coverage for Bodily Injury and property damage caused by you operating your ATV or off-road vehicle. Comprehensive coverage, this insurance protects your ATV or off-road vehicle in the event that it is damaged by something other than a collision with another vehicle; this can include theft, fire, vandalism, flood, hail, collision with an animal, and many other issues that may cause damage to your ATV or off-road vehicle. Collision coverage, with this coverage your insurance company pays for significant damage to your ATV or off-road vehicle when you collide with another vehicle, ATV or off-road vehicle, object or obstacle. If you hit a car, a pole, a post or another non-living object; collision coverage will protect your vehicle. Due to the nature of off-road traveling, minor scratches and dents aren’t usually covered. Let the passionate and experienced agents at Menath Insurance work to protect your ATV and off-road vehicle with our insurance coverage today. We’ll ensure that you are fully protected in the event of accidents or damage to you or your ATV or off-road vehicle. Call or click for a free quote today. Whether you’re a hunter, rancher, farmer, or a trail rider you need to make sure you and your vehicle are protected.